In our last lesson, we implemented a linkage to our WidgetAccessory class, and debugged some errors we encountered along the way. We now have our data being returned by REST, but what if we want to update or add new data to our application? So far we have only used HTTP GET commands with our REST Services, we now have to implement PUT (which roughly corresponds to an Update) and a POST (which roughly corresponds to a Create. Author's note: there is a lot of writing online about why this statement isn't entirely correct, I'm not going to go into the detail here). However, before we start, we notice that we should probably do some refactoring, since we want to be interacting with Widgets. REST typically involves accessing a logical, human readable URL pattern, so we should really tie our Widget methods to a Widget URL. We could just add these into the REST.Dispatch class, but this will lead to a very bulky class. Luckily, we can set a forward from the Dispatch class to another class which also inherits from %CSP.REST. 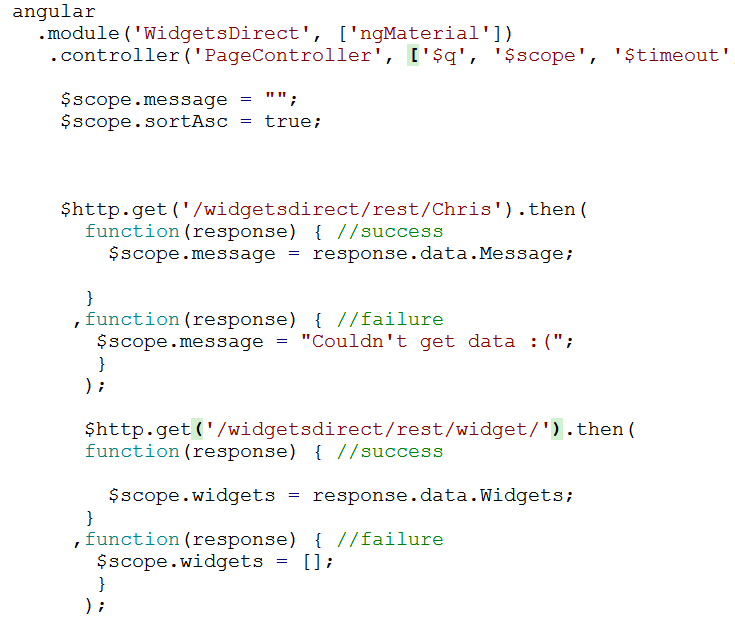 So with this in mind, we want to create a REST.Widget class, and route all widgetmaster/rest/widget/ calls to it. With these 5 Services, we can implement a full CRUD system for our class. By GETing the default path, we can return all instances (for browsing/searching), or we can GET a specific record by its ID (useful for returning more detail on larger objects). We can PUT an update to a specified object instance, and we can POST a new object entirely to the default path. Finally, we can implement a DELETE call, which will perform some form of Deletion or Archiving to the specified object. 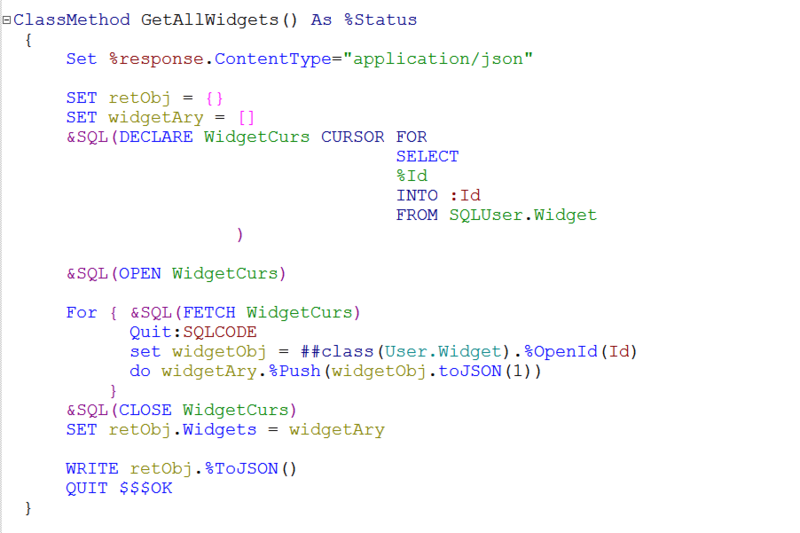 We can implement the GetAllWidgets first, as we already have the code in our REST.Dispatch class. We create the GetAllWidgets classmethod (with no params) and paste over the code from REST.Dispatch, removing it from that class when we're done. Now, we move to using our new fromJSON method to update or add objects. These 2 classmethods are basically identical, with the UpdateWidgetById using the supplied ID value to open a specific object instance, while the AddNewWidget just performs a %New() to get a new object instance to write to. Once an object instance has been loaded, the fromJSON is run. 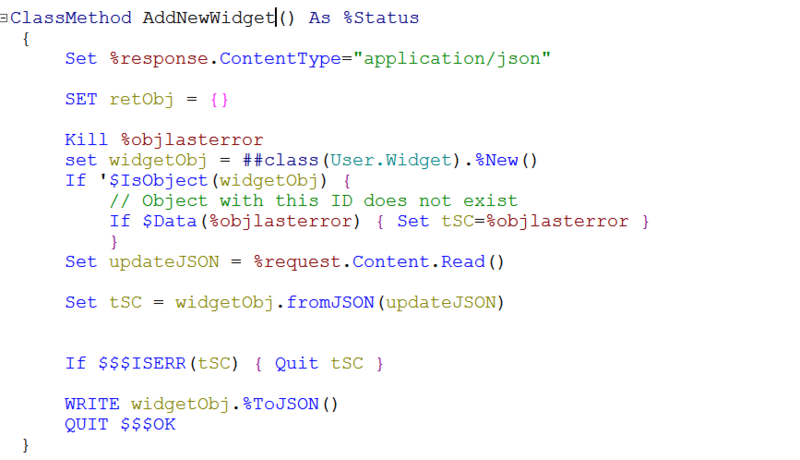 This takes the contents of the Request as the JSON input - Set updateJSON = %request.Content.Read(). Any Save errors are passed back to the client. As a final step, the current state of the object is returned using the toJSON(). This is very useful when we start implementing these calls in our application, as we can instantly rebind the current state of the object to the display, without having to make a secondary call to a GET. Let's check that our new and updated data is available on our Welcome page. First, however, we need to point the pageController at our new service to get the full list of Widgets (since they are no longer returned from our HelloWorld service). 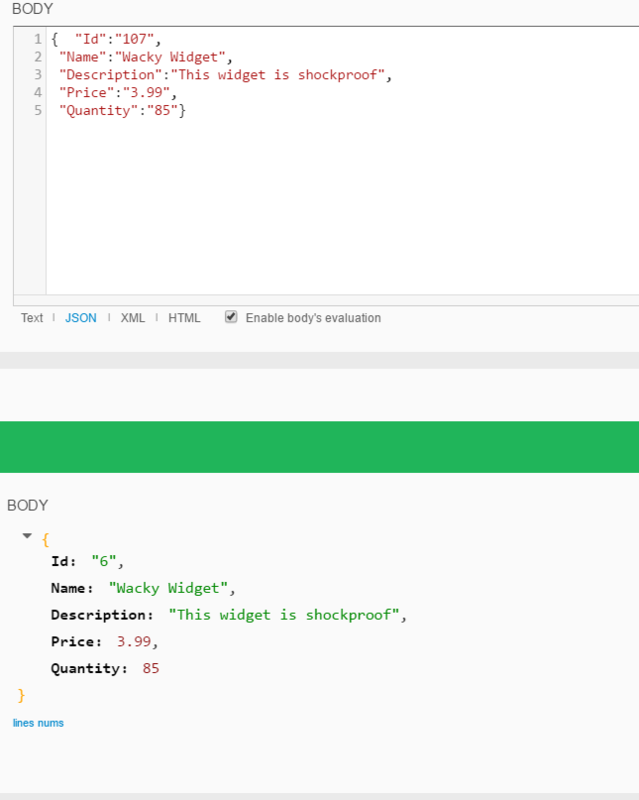 We implement a second $http.get and assign the response to the Widgets array. 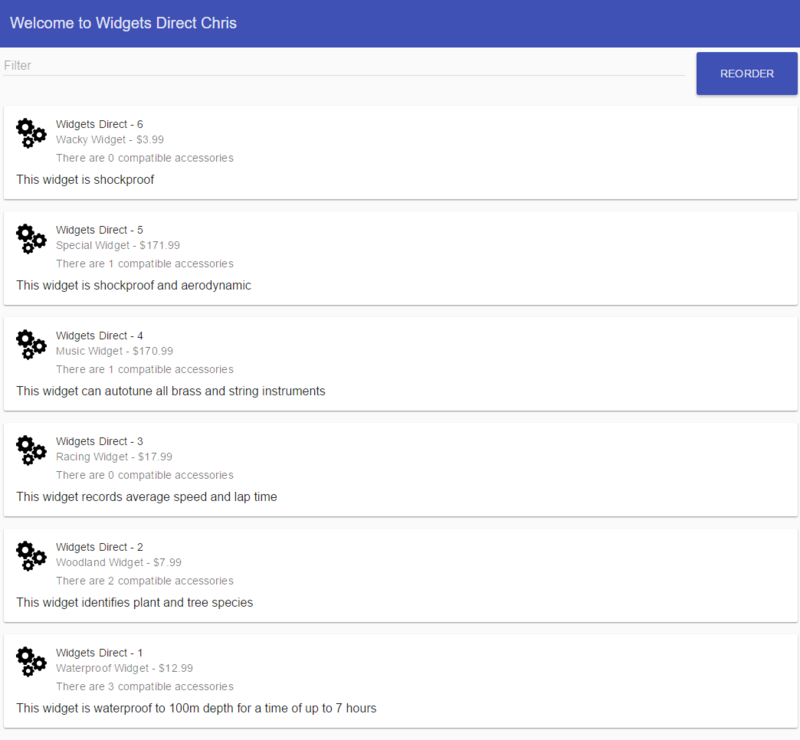 If we fail in our call to the Widgets service, we set the Widgets array to empty, to prevent warnings from anything trying to read the array. Any ideas why this error would come up? Are you using Chrome to debug? You should be able to click through to the error on the Network tab from the Deubgger. Anything that returns an error code should be highlighted in red, and if you click that red text, then it should give you the specific error coming from Caché. If you get this error, I should be able to find my mistake in the exported code. I found the issue. 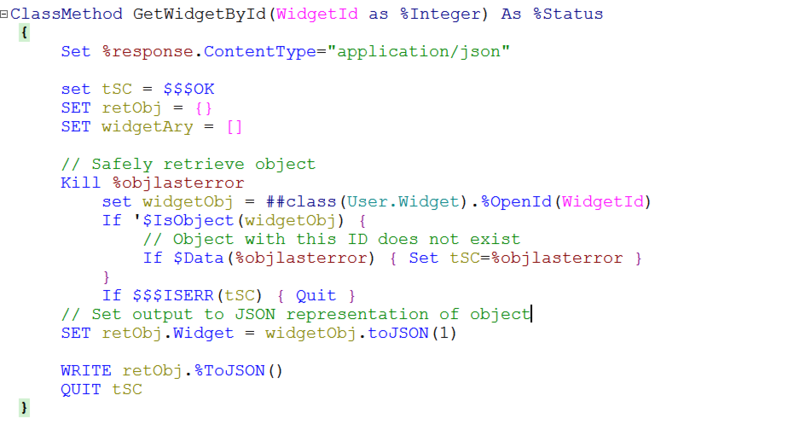 do widgetAry.%Push in GetAllWidgets User.Widget.cls does not exist in Cache 2016.1 at least in the version I have been using. Looks like some of the images are missing. Hi, Ed! Thank you! We'll try to fix the problem.